Constant Research and Development is underway year-round to keep up with current standards, technology, and trending themes in not just one, but more than five different industries. Staying ahead of the curve, while keeping up with advancements allows E.G.D.F. Labs to be a constant innovator. Pushing forth new ideas and new formulas of execution, each project undertaken is a new vision, a new calculation, and a new formula for success. For these precise reasons, every project begun for a new client is made from a blank canvas, never reusing a single element of another project done prior. The use of templates is strictly forbidden at E.G.D.F. Labs, unless needed for size specification in print (or other such cases where it is needed for meeting outsourced guidelines). While the above seems like a time consuming and daunting task, the expertise and experience provided always ensures that no matter how experimental the lab environment may get, client deadlines, and schedules are always the top priority, with no sacrifice to quality or quantity. Formed in 2011 by an artist, for artists, E.G.D.F. Labs has been seeking out unsigned talent, deep in the Electronic Dance Music underground. The main goal of E.G.D.F. Labs as a label is to provide it’s artists with the freedom to create, while also establishing all the proper avenues of music industry standards an artist needs today in this complex market. Our levels of quality and standards are pushing the envelopes of how digital media can utilize the oscillations of Light and Sound. One thousand words could not encompass the experience, and portfolio E.G.D.F. Labs has built for itself over the years. 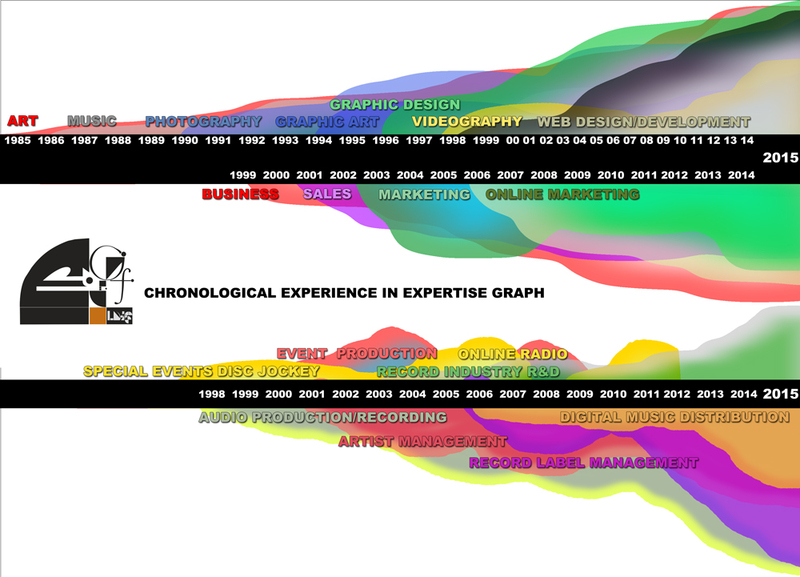 The following is a graphed representation of experience based on project volume and implementation of expertise. Chronological Experience in expertise areas. 1985-2015. Click for detailed image. Current clients and partners may receive any or all of these consultation services at no additional charge.